What is preventing those who do not own a phone from purchasing one? 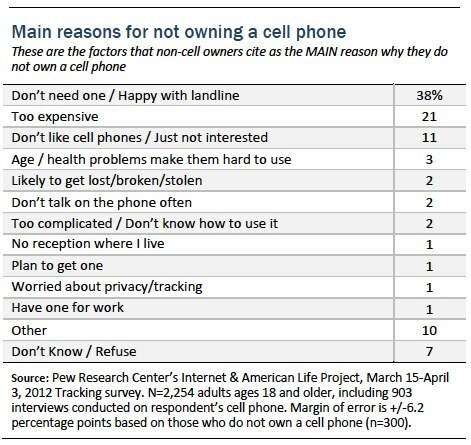 Some 15% of US adults do not own a cell phone at all, and we presented these non-adopters with an open-ended question in which we asked them to tell us the main reason why they do not own one. The largest proportion of these non-owners say that a lack of need or interest is the main thing standing in their way: 38% don’t need a cell phone or are happy with their landline, while 11% say that they don’t like cell phones or simply aren’t interested in purchasing one. Economic factors are the second-most common reason given, as one in five non-owners (21%) say that they do not own a cell phone because they are too expensive. The relatively small number of non-cell owners in our survey (and the general lack of demographic diversity within this group) limits our ability to compare reasons for non-adoption among different groups. However, older adults are especially likely to say that they don’t have a cell phone because they don’t need one or are happy with their existing landline phone. What is keeping non-smartphone owners from upgrading? 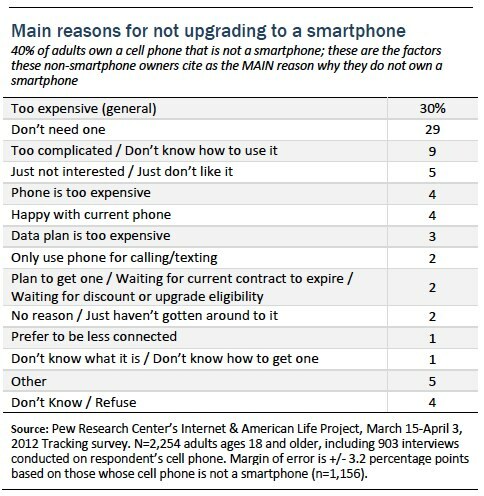 In addition to asking why people might not own a cell phone in the first place, we also asked the 40% of the population that owns cell phone but not a smartphone to tell us the main reason why they do not own a more advanced device. Overall, cost plays a much more prominent role for upgrading to a smartphone, than it does for deciding whether or not to get a cell phone in the first place. A total of 37% of non-smartphone owners mention price in one way or another as the main reason why they haven’t upgraded — 30% say that smartphones are too expensive in general, 4% say that the phone itself is too expensive, and 3% say that the cost of purchasing a data plan is their primary concern (as noted above, 21% of non-cell owners cite price as the main reason why they do not own a cell phone at all). At the same time, a sizeable proportion of basic cell owners simply don’t see a need to upgrade their phone. Some 29% of non-smartphone owners say that they “don’t need” a more advanced phone, while an additional 5% are “just not interested” and 4% say they are happy with their current phone. Digital skills/literacy issues also play a prominent role, as 9% of non-smartphone users say that they have not upgraded because smartphones are too complicated and/or they don’t know how to use them. Indeed, just 2% of non-smartphone owners responded to this question by saying that they have definite plans to purchase one in the future. 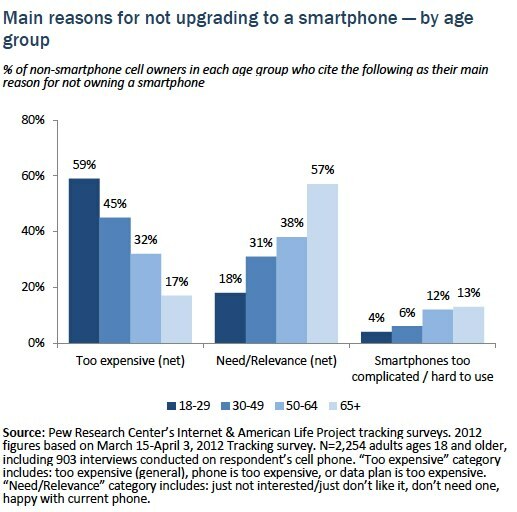 The reasons people give for not upgrading to a smartphone show significant variation based on age. In particular, younger non-adopters are much more likely than their elders to say that cost is the main factor preventing them from purchasing a smartphone, while older non-adopters are more likely to point towards a lack of need or interest, or towards challenges with using a more advanced device. Similarly, non-owners from higher-income households are more likely to say that they do not own a smartphone because they don’t need one — in contrast to those from lower income households, who are more likely to point towards the expense of upgrading as the primary factor standing in their way.